Trade tensions between the US and China, the world’s two largest economies, have been and continue to be a major concern for investors all over the world, injecting a great level of uncertainty into the global economy. It is therefore imperative to examine the economic fundamentals of the Sino-US trade imbalance. To do that, we must look at both countries’ economic policies to trace the roots of the issue. The US has been in constant trade deficit since 1976. Since 1999, its deficit has never dipped below two percent of GDP, peaking in 2006 at 5.5 percent. Since then, it has maintained an average level of about three percent of the country’s GDP. One major reason behind the US’s trade deficit lies in its low savings rate and high rate of consumption. In the past decade, the average personal savings rate of Americans hovered around six percent, reaching a historical low of 2.4 percent in 2017. 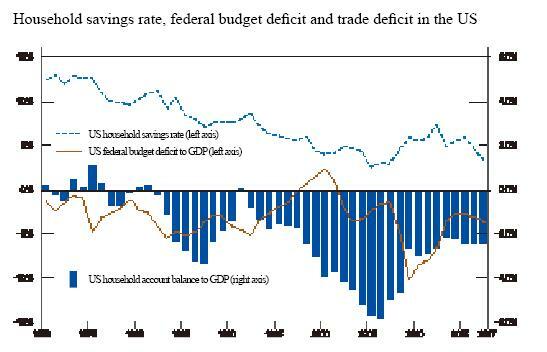 The US Federal government also has no savings, having run on deficit for 17 years since 2002. By the end of September 2018, US gross national debt reached a record high of US$21.52 trillion, accounting for 105.4 percent of its current-dollar GDP. The Trump administration’s tax cut plans are expected to further raise the debt level in the coming years. A high debt level, combined with a low savings rate, means the US consumes more than it produces, so the additional spending has to go to foreign goods and services. With minimal savings to put into investment, the US has to either borrow from foreign investors, or to extract foreign funds to the US. This is the driving force behind the US trade deficit, which exists not just with China, but with almost all industrial powers. Another major reason is the dollar’s status as the global reserve currency, which allows the US to enjoy what economists call an “exorbitant privilege.” Unlike any other country which needs to produce an equivalent value of products to obtain US$100, the US can simply print a 100 dollar bill to purchase imports from other countries. 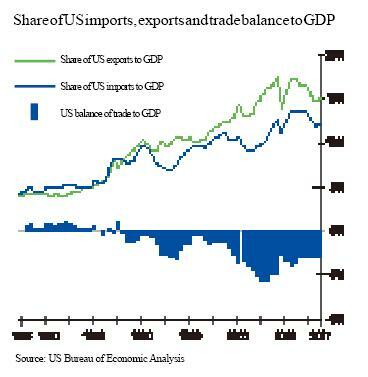 The US is also immune from concerns over a current account payment crisis, which can be caused by a persistent current account deficit in any other country. This means that when the US government does not have enough revenue, it can always resort to issuing treasury bonds. By the end of 2017, the total amount of treasury bonds amounted to US$12.3 trillion, more than 50 percent of which had been purchased by foreign investors. This is why the Trump administration is able to launch a tax cut plan and expand the government deficit at the same time, even though it will further push up government debt. It is estimated that the fiscal deficit of the US Federal Government will increase from 3.5 percent of annual GDP in 2017 to 4.6 percent in 2019. 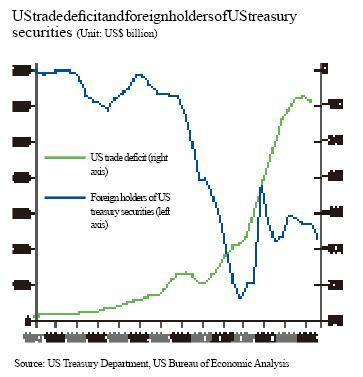 To put it simply, the US’s global trade deficit, including that with China, is a result of structural problems inherent in the US economy, including a low savings rate, high consumption rate and an expansionary fiscal policy, something enabled and encouraged by the financial privilege of the dollar’s global reserve currency status. That is precisely why the US trade deficit has grown by a further seven percent in the three-month period between May and July, despite additional import tariffs imposed on major trading partners, including China. In fact, Washington’s trade protectionism will very likely harm its own long-term economic development. China appears to be just the opposite of the US in many aspects. Compared to the US, China has long maintained a very high savings rate. Since joining the World Trade Organization (WTO) in 2001, China’s total exports have rapidly increased, maintaining an annual growth rate of over 20 percent between 2001 and 2007. In the same period, China’s personal savings rate increased from 36 percent in 2000 to 51 percent in 2007. While the rapid increase in exports has made a great contribution to China’s economic growth, it has also led to an unbalanced economy, especially when a high savings rate resulted in a low consumption rate, a problem exacerbated by the global financial crisis in 2008. Since then, China has conducted sweeping structural reforms to promote domestic consumption. Between 2007 and 2017, the contribution of domestic consumption to national economic growth increased from 50.1 percent to 58.8 percent, while the service sector accounted for 51.6 percent of the economy in 2017, up from 42.9 percent in 2007. In the meantime, China’s trade surplus with the rest of the world as a percentage of GDP has steadily decreased since 2007. 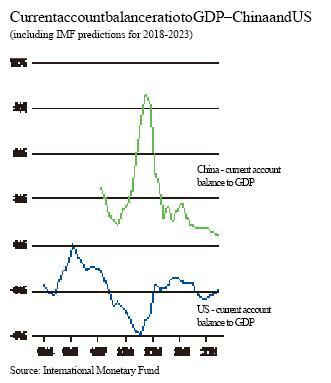 In 2017, China’s current account surplus dropped from 9.9 percent of annual GDP in 2007 to 1.3 percent in 2017, about the same level as prior to China’s entry into the WTO. 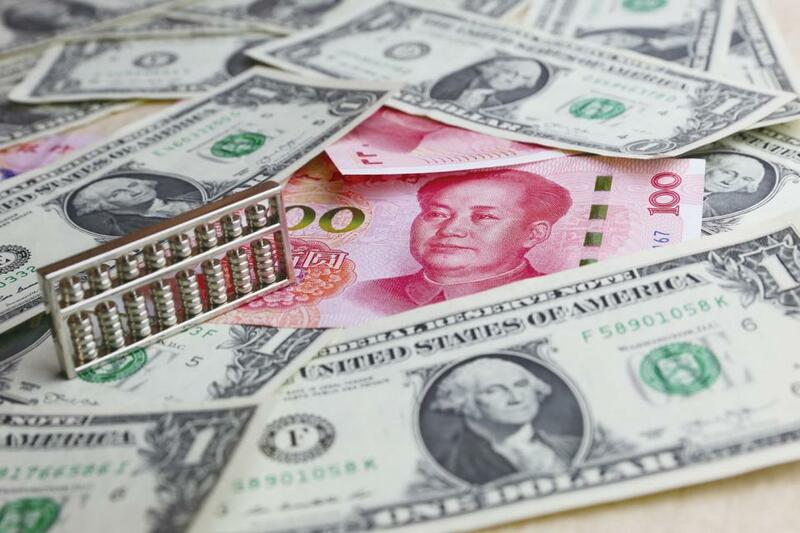 During the first half of 2018, China reported a current account deficit of US$28.3 billion, the first in 20 years. This shows that China has not intentionally adopted unilateral commercialism as a way to maximize its trade surplus as some have accused it of. Instead of focusing on promoting exports, China’s economic policy centers on domestic-oriented structural reform. Moreover, much of the trade deficit with China is created by US companies. For example, Apple iPhone products alone contribute about US$17 billion to the trade deficit of the US on paper. But in reality, most of its value went to various foreign suppliers of Apple, such as South Korea’s Samsung and Japan’s Toshiba. It is estimated that only five percent of the manufacturing cost of iPhone products goes to Chinese suppliers. It is both unfair and unrealistic to expect China to sacrifice its own interests and economic health to solve a problem that results from an internal imbalance in the US economy. Given the different structures of the two economies, the trade relationship between China and the US is still complementary. First, unlike the trade disputes between the US and Japan in the 1980s – between two developed economies as Japan’s per capita GDP had already reached the same level as the US’s – the trade relationship between the US and China is still one between a developed economy and an emerging economy, as China’s GDP per capita is only one-seventh the size of the US’s. Second, unlike Japan, whose GDP was only 32 percent of that of the US in 1985, the Chinese economy is now 62 percent of the US’s, which means China has the potential to provide a much greater market for American products, making the trade relationship between the two countries more reciprocal. Third, bilateral trade between the US and China is more of a supply-chain trade, which is associated with international production networks, rather than inter-industry or intra-industry trade. In short, it means rather than directly competing with each other within an industry, the US and China occupy different positions in an international supply chain. By 2016, labor intensive products, including light industrial products and low-end electronic products, accounted for 80 percent of China’s exports to the US. 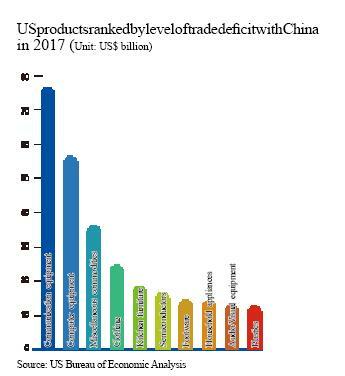 In the meantime, the US has a solid position in the supply chain of high-end industries, with exports of intellectual property worth US$128 billion, 26 times that of China. teThe problem with the supply chain trade between the two countries is structural. For example, while American multinationals have garnered huge profits from their trade with China, the supply chain of low-end industries in the US may witness a decline, such as those in the rust belt states. Given the overall reciprocity of the bilateral relationship, the US should address this problem through domestic structural measures to better distribute resources between the winners and losers of globalization, rather than using its entire trade with China as a scapegoat. In the past years, the Chinese economy has been transforming into one driven by consumption, which will not only help China sustain its economic growth, but will provide massive opportunities for advanced economies, including the US. In the past years, China has experienced major demographic changes, which has led to a decline in its labor force. These changes will inevitably drive down China’s savings rate and promote consumption. In the process, China’s consumption will increasingly shift from low-end consumer products to high-end products, which will offer advanced economies, including the US, greater market potential. As a matter of fact, this scenario is already happening. In 2017, Chinese purchased 32 percent of the world’s luxury products, mostly made by foreign companies. China’s overseas students and outbound tourists also made major contributions to the economic growth of various countries, including the US. During the earlier trade negotiations, China offered to increase imports of American products and services, which serves the interests of both countries. By contrast, escalating the trade dispute with China will not only fail to fundamentally address the trade imbalance of the US, but will also limit the access of American products to the Chinese market, hurting US consumers and the country’s economic development in the long run. The US must be aware that the robust economic growth experienced by the US in 2018 came as a result of its recent tax cuts and fiscal stimulus. By the time the policy effects start to diminish in 2020, its side-effects, such as inflation, will start to kick in. Trade tensions with China will further drive up inflation, causing consumers to rein in their spending and US companies to possibly reduce investment due to concerns over uncertainties. All these will increase the possibility of an economic recession in the coming years. To effectively solve its trade imbalance, the US should look inward to address its structural problems within its economy. In the past decades, the US has taken advantage of its financial dominance to paper over its domestic problems at a very low cost. Whenever the US encountered a financial problem, it has resorted to printing money, directly or indirectly. But as the US continues to abuse its financial dominance, it has eroded many countries’ trust and confidence over the global monetary order that centers on the greenback. If the US continues to refuse to reflect on ways to address its domestic economic problems and instead entrenches itself further into its debt-centric approach, it will further dampen confidence in the US dollar and expose the US economy to serious financial crisis. Zhu Min is chairman of the National Institute of Financial Research, Tsinghua University and former vice president of the IMF. Miao Yanliang is a chief economist with the State Administration of Foreign Exchange Investment Center.